When our client brought a 21,575 square-foot medical office building in Clinton Township to us for property management services, he was clear that he wasn’t planning to hold it for long. John Bridges, CPM, Director of Management Solutions immediately developed a plan to increase the property’s value and prepare it for sale. Strong relationships are at the heart of the way we do business at the Thomas Duke Company. 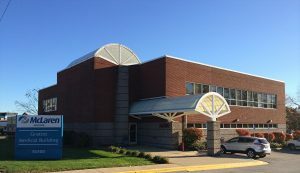 As we got to know the building’s tenant, McLaren-Macomb Health Care, we learned of their desire to remodel the entire second-floor suite. Taking that into account, John negotiated a new 7-year lease extension in which the tenant agreed to annual rent increases aligned with market rates while our client agreed to a substantial build-out allowance for the renovation. At the end of negotiations our client’s property had a single tenant with strong credit committed to an 11-year, triple-net lease – making it a very valuable asset. This prime property was now stabilized and ready to be listed. Engaging the Thomas Duke Company’s extensive database, Dave Tesch of the brokerage division found an ideal buyer: a Seattle-based real estate investment trust that focuses on single-tenant healthcare properties. Dave negotiated an offer with them—but the deal hinged on having renovations completed by day one of their ownership. The timeframe was tight. Any construction project is apt to have hitches in design, materials supply, and labor. This one was no exception. We instituted our project management protocols and called on our network of trusted contractors, working with them closely. It took persistence, but in the end we delivered a beautifully renovated medical building right on time and on budget. The seller too was pleased with his return on this investment in the timeframe he’d chosen. Commercial real-estate transactions are often layered, involving several stages. Smart investors look for a company that can orchestrate all the stages professionally, without costly interruption. The Thomas Duke Company is exactly that sort of professional, full-service real estate firm. Call us today to help you navigate your next investment transaction smoothly.